Here is a riddle, what is wrong with this brand new .NET 4.0 console application that only references the log4net 1.2.10.0 dll? C:\Windows\Microsoft.NET\Framework\v4.0.30319\Microsoft.Common.targets(1360,9): warning MSB3253: The referenced assembly "log4net" could not be resolved because it has a dependency on "System.Web, Version=4.0.0.0, Culture=neutral, PublicKeyToken=b03f5f7f11d50a3a" which is not in the currently targeted framework ".NETFramework,Version=v4.0,Profile=Client". Please remove references to assemblies not in the targeted framework or consider retargeting your project. The projects target framework is set to the client profile version of the .NET framework, which excludes (typically) server side assemblies such as System.Web. Changing the Target framework under the Application project properties resolves the issue. 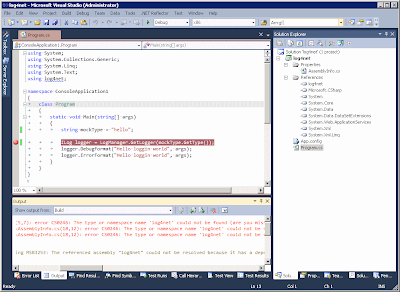 Solved: .NET 4.0 cannot find assembly reference even though assembly is there and there are no exclamation marks on the reference in Visual Studio 2010. 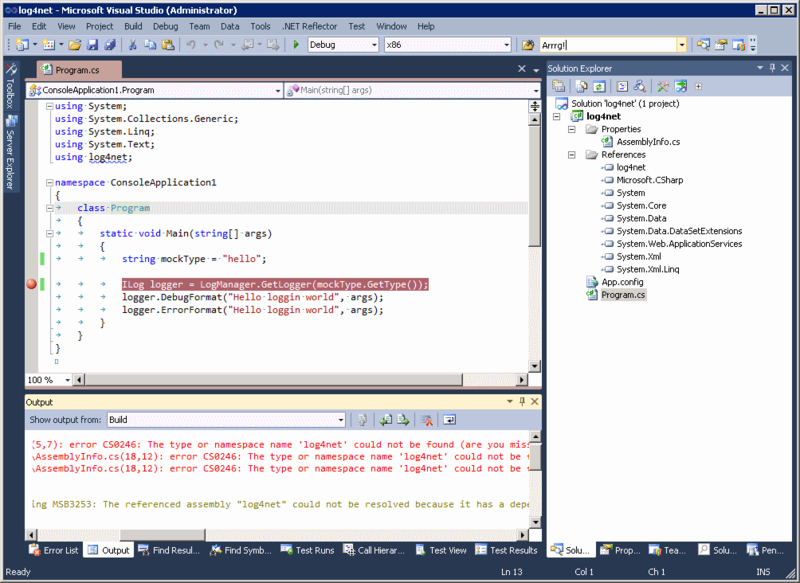 The linked blog explains the difference between the full and client profile install of the .NET framework. Still, why does log4net need System.Web in the first place? I ran the log4net.dll through a reflection tool. The dependency comes from the log4net.Appender.AspNetTraceAppender which accesses the HttpContext from the Web namespace. Thanks Daniel. I was able to fix the issue quickly with your posting. My target framework was already targeting the full .NET 4.0, I had to set the log4net dll reference to "Copy Local=True" to make it work.